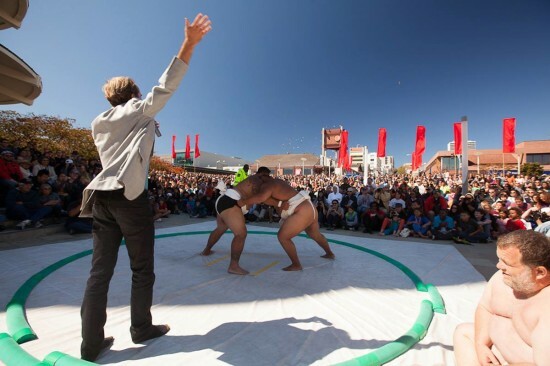 Matches will be held in a dohyo (sumo ring) in San Francisco Japantown’s Peace Plaza. SAN FRANCISCO — The Japan Center Malls and the Japantown Merchants Association invite the public to the third annual Sumo Champions Exhibition in the Japantown Peace Plaza, Post and Buchanan streets, on Sunday, Oct. 5. Free kids’ meet-and-greet at 11 a.m.; matches at 12, 2 and 4 p.m.; meet-and-greet at 5 p.m.
Bring the family to meet real sumo wrestlers, learn about the ancient Japanese tradition and martial art, and watch live matches — for free. • Yama, 6’4″, 600 lbs., heaviest Japanese human being ever. • Byamba, 6’1″, 370 lbs., Mongolian, three-time world sumo champion. • Kelly, 6’0″, 430 lbs., three-time U.S. sumo champion and Guinness World Record holder as the heaviest human ever to run a marathon (he competed in the Los Angeles Marathon in 2008 and 2011). This event is made possible with support from the Japan Center Malls and the Japantown Merchants Association, and in partnership with SF Weekly, the Center for Asian American Media, and USA Sumo. For more information, visit www.japancentersf.com/.